Suddenly, the Providence Bruins have a formidable forward group. 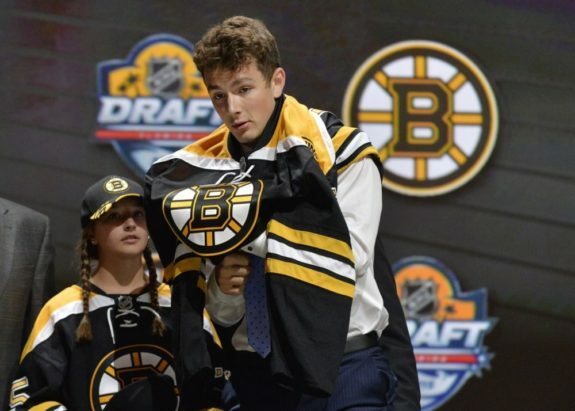 Ryan Donato joins a team that had already improved thanks to some veteran help and budding young talents. The P-Bruins suffered a tough road loss to Springfield a week ago but exploded for six goals in a victory over Bridgeport. Despite the offensive outburst, Donato may give the P-Bruins an element the team has been missing this season. He picked up an assist in his debut weekend but the team suffered a pair of losses to the division-leading Charlotte Checkers. Donato in a Providence sweater may come as a bit of a surprise, but it could be beneficial to the player and the P-Bruins. First, there’s Donato, who had a whirlwind 2017-18 season. 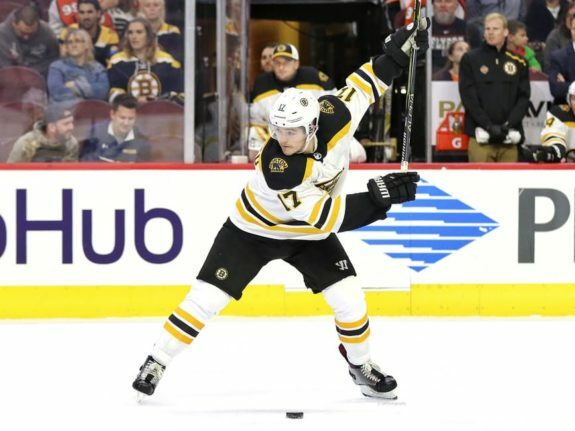 He was a “Hobey Hat Trick” finalist for the Harvard Crimson, rolled out at Citi Field in New York as one of team USA’s first selections for the Winter Olympics, and finished the season on the playoff-bound Bruins. Not to mention, he was still taking classes at Harvard during his NHL introduction. Donato excelled everywhere he went last season, a standout at Harvard and in the Olympics against professional players. He picked up three points in his Bruins debut in March. Needless to say, he brings about as much experience as a 22-year-old could possibly bring to Providence. He ended the season as a healthy scratch in the Stanley Cup playoffs and had a slow start this season. Stepping out of what has been a never-ending spotlight may be a good thing for the young forward and the P-Bruins can benefit from his stay. While Providence hasn’t exactly struggled to score goals, averaging three per game before their six-goal explosion, they could use a play-maker. Providence has a strong group of forwards, literally, skilled players like Peter Cehlarik and Jakob Forsbacka-Karlsson can be difficult to play against and strong on the puck. The P-Bruins boast a number of forwards known for their two-way game. If there’s one thing that’s been missing, its someone with high-end skill who can create offense, especially after the departures of Kenny Agostino and Austin Czarnik. Donato has the ability to create on his own with a quick-release when he gets to the goal. Recently signed veteran Jan Kovar is calm with the puck and has shown flashes of creativity, but doesn’t have Donato’s speed. Reinforcements are welcome as crafty veteran forward Mark McNeill remains out of the lineup due to injury. While facing the big early-season test, Providence will need another pair of young forwards to continue to be offensive threats. Cameron Hughes and Zach Senyshyn have paced the offense early in the season. The rookie Hughes netted the first hat-trick of his career against Bridgeport, displaying an accurate shot by snapping his second goal over the shoulder of Bridgeport starter Christopher Gibson after a scramble. He capped off the three-goal effort on a penalty shot. The offensive instincts displayed by Hughes is a positive early sign. Another young forward in the system known as a smart two-way player, Hughes’ offensive game has quickly translated to the pro level. A common theme among P-Bruins forwards, Hughes has been relentless on the forecheck. He’s also strong on the puck, and when it leads to an opportunity he’s made opposing teams pay. The other young forward headed in the right direction is Senyshyn. He has four goals through his first 11 games of the season after 12 in 66 games last year. He had two a week ago against Springfield that weren’t highlight-reel material, but the 2015 first-round pick is showing signs of improvement. Senyshyn’s second goal was a rebound that bounced off him and went into the net. It’s a small example of what’s improved in his game. The goals may not be pretty, but Senyshyn is getting to areas of the ice where he can make something happen. He appears to have more confidence using his speed to put pressure on defenders. If he can keep utilizing the tools that made him the 15th overall pick, more goals of all varieties will come. Donato may not have a long stay in Providence, unless Boston finds a way to generate more secondary scoring in the lineup, but the P-Bruins can benefit from his time with them. He brings a creative element the team has been lacking early on. Providence needs to find a spark soon, entering the second month of the season in the Atlantic Division basement at 3-7-1-0.